Here is his latest piece on the Newtownards Road in East Belfast! Dee sends warm greetings to all of his friends at Swarthmore! David “Dee” Craig, a prolific mural artist from Northern Ireland, created a large mural that is now mounted on the southeast end of the College’s Science Center. Craig’s work was facilitated by the Mellon Tri-College Creative Residencies Program. Supported by the Andrew W. Mellon Foundation, the program supports faculty of Swarthmore, Haverford, and Bryn Mawr Colleges from the natural sciences, social sciences, and humanities divisions to design and implement arts residencies in association with their curricular and scholarly agendas. From Oct. 28 to Nov. 18, Craig painted and worked out of a purpose-built studio tent adjacent to the Science Center wall that his mural now covers. Painting first in the tent and then later directly on the wall, Craig’s mural took form before the eyes of students, staff, and faculty as they went about their work or walked to their classes. Craig also participated in two public conversations about mural art, conflict, and peacebuilding in Northern Ireland, first at Swarthmore’s McCabe Library to open an exhibit of his murals in Northern Ireland and again at Bryn Mawr, for an event sponsored by the Solomon Asch Center for the Study of Ethnopolitical Conflict. 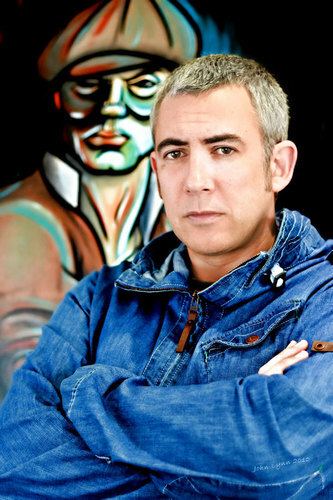 Craig hails from East Belfast and is well known internationally in mural arts circles for his work, and his pieces have often been part of initiatives to replace paramilitary murals that became common during the 30 years of open conflict known as “The Troubles.” Such “reimaging” projects are part of the ongoing and sometimes halting transformation of conflict in Northern Ireland. 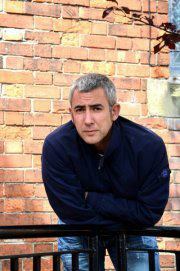 A renowned artist, Craig was named one of the Belfast Media Group’s top-40 artists under 40 in 2008. 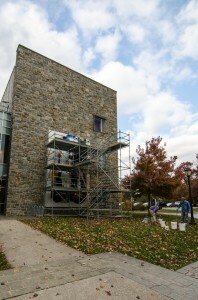 Dee Craig Mural Installation at Swarthmore College from Swarthmore Peace Studies on Vimeo. Throughout the month-long residency, Craig visited with seven classes across the three colleges. Students were also able to learn with him by collaborating on the project. Craig had much to teach, but he doesn’t hesitate to concede that during his time at the College, he learned a great deal about Swarthmore and about his practice. “Swarthmore feels like a very positive place,” he says. “It has been inspiring.” He elaborates that the local techniques for painting murals in Philadelphia are entirely new in Belfast. Paul Downie, executive director of the Community Arts Center in Wallingford, Pa., provided training and consultation on the process of painting on cloth panels that are subsequently adhered to a wall. Craig’s residency was truly an exchange. Just as Craig shared his unique experience and talent with Swarthmore, the College was able to offer him training in a new mural painting technique. Perhaps most importantly, new relationships and networks have been established that will support peacebuilding and creative arts both in the U.S. and in Northern Ireland. A few weeks ago, we posted a video of the collage installation by Dee Craig and Paul Downie on the second floor of Kohlberg Hall. Now, there is also a video of the mural installation on the side of the Science Center that was part of Craig’s Mellon Creative Residency this semester. The large mural being painted on Swarthmore’s campus by Mellon Creative Resident, David “Dee” Craig, will be launched on TUESDAY, November 12 at 12:00 NOON on the southeast corner of the Swarthmore College Science Center (next to the DuPont Parking Lot). The planning and creation of this mural has actively involved students, faculty, and staff. Come join us in thanking the artist and many others who have made this project a success. Light food will be available in the studio tent at the wall (where we will gather in the event of rain). Dee Craig, an experienced artist from Belfast, Northern Ireland, specializes in large-scale mural projects and has been involved in community art for over 20 years. Throughout the month-long residency, Craig has visited with classes across the Tri-College Community (Swarthmore, Haverford, and Bryn Mawr) and displayed an exhibit of his work and mural art in Northern Ireland in McCabe Library. 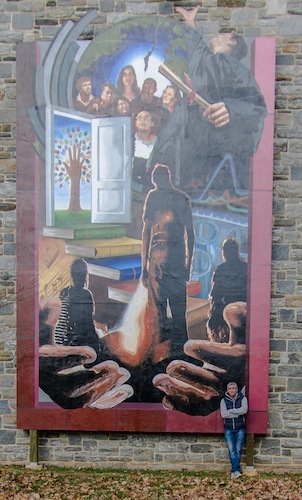 Craig’s mural marks this year’s 150th anniversary of the founding of Swarthmore College, and the celebration of 125 years since the first higher education course in Peace and Conflict Studies was taught at Swarthmore College. We would like to thank the crowd of over 50 swarthmore faculty, staff, and students who attended the public conversation with Dee Craig on Thursday afternoon in McCabe Library. We appreciated the thoughtful dialogue and we look forward to much more of the same over the coming weeks of Dee’s residency at the Tri-Colleges. Many thanks to Susan Dreher, Tom Bonner, and Annette Newman who worked so hard to make the exhibit a reality. As part of the Mellon Creative Residency that we are sponsoring, Paul Downie of the Community Arts Center near campus introduced Dee Craig to a mural arts technique yesterday by creating a collage on the second floor of Kohlberg Hall. Mellon Creative Residency Collage Installation at Swarthmore College from Swarthmore Peace Studies on Vimeo. Follow the Tri-College Creative Residency via Storify on our blog. You can follow developments in the Tri-College Creative Residency via this blog post. 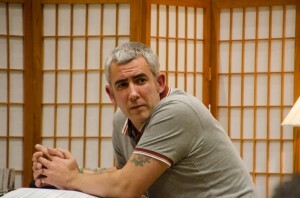 More information about the residency, including upcoming events is available at http://bit.ly/swatcraig. As students, faculty, and staff return from Fall Break, they will be joined by a visiting mural artist from Belfast, Northern Ireland. David ‘Dee’ Craig will take up a Mellon Creative Residency for one month during the fall semester 2013. Mr. Craig’s visit follows a visit to Swarthmore College by the Bogside Artists in 2008 and will feature a photo exhibit in McCabe library, public talks, a range of class visits, an indoor installation, a large outdoor mural installation, and a partnership with the City of Philadelphia Mural Arts Program. 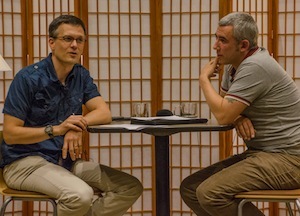 The first event of the residency will involve Mr. Craig working with Paul Downie, local mural artist and Director of the Community Arts Center in Wallingford. Mr. Craig and Mr. Downie will install a collage mural in the Sociology and Anthropology wing of the second floor of Kohlberg Hall on October 23. 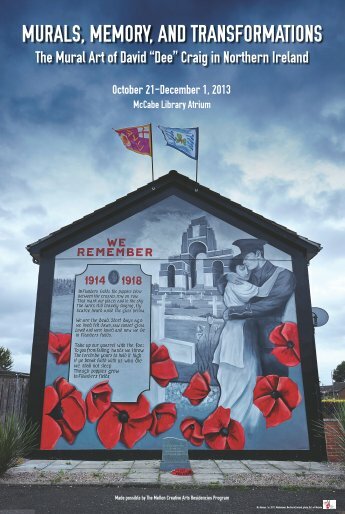 Thursday, October 24, 4:15 p.m.
On Thursday, October 24, we will open a photo exhibit of Mr. Craig’s mural art in Northern Ireland in the atrium of McCabe Library. Visitors will be able to view Mr. Craig’s work in Northern Ireland and learn more about the relationship of mural arts with conflict, memory, identity, and peacebuilding in the region. Prof. Lee Smithey will conduct a public interview with the artist at 4:15 in the McCabe Library atrium. This event is open to the public, and a reception will follow. 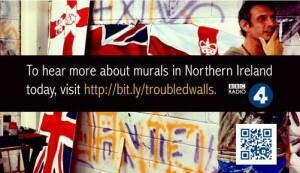 You can also learn more about mural arts in Northern Ireland by visiting http://bit.ly/troubledwalls and listening to a recent radio documentary on the subject from BBC Radio 4. Mr. Craig will paint a large mural on canvases that will be mounted on a prepared surface on the southeast end of the Science Center. The artist will paint in a tent that is being erected near the wall, and in the spirit of public art, students, faculty and staff will have the opportunity to engage with him as they pass the tent while he is painting. Several students have applied for spots to work with the artist on the creation of the mural. Mr. Craig brings his skills and experience to our campus from the oldest continuous mural arts tradition in the world while also exploring the techniques and style of the mural arts scene in Philadelphia. Students, staff, and faculty met on three occasions during the fall semester to offer input into the content of the mural. We appreciate the collaborative process that Mr. Craig has encouraged, we look forward to seeing how he will interpret our community visually, and we hope the residency provides an opportunity for mural making in a new context. Monday, November 11, 4:15 p.m.
For anyone who missed the opportunity to hear the first public interview with Mr. Craig at Swarthmore, we will have the opportunity of another public conversation with him on Monday, November 11 at 4:15 p.m. in Carpenter Library, Room B21 at Bryn Mawr College. This event is sponsored by the Solomon Asch Center for the Study of Ethnopolitical Conflict. See directions to Bryn Mawr College and a campus map. Tuesday, November 12, 12:00 p.m. Please join us at the southeast corner of the Science Center on Tuesday, November 12 at noon for a mid-day “launch” of the new mural on Swarthmore’s campus. Throughout the month-long residency, Dee Craig will visit with nine classes across the Tri-Colleges. Supported by the Andrew W. Mellon Foundation, the Tri-College Creative Residencies Program encourages Haverford, Bryn Mawr, and Swarthmore faculty from across the three divisions-natural sciences, social sciences, and humanities-to design and implement arts residencies in conjunction with their curricular and scholarly agendas. The program takes as its primary goal the broad integration of the arts through small liberal arts college curricula, seeking particularly to stimulate the creation and enhancement of courses and broader curricular missions by supporting extended, multi-dimensional arts residencies that combine pedagogy, public presentation, and informal exchange among artists, faculty, students, the wider campus, and area communities. Though Mr. Craig has a burgeoning fine art career, with exhibitions in Northern Ireland, Great Britain, and California, Mr. Craig’s residency will focus on his community and mural art and will provide an opportunity for students, faculty, and staff to explore the role that public art can play in framing public issues and collective identities, including in conflict situations. The residency was inspired by a research project based out of Swarthmore College and Hofstra University. 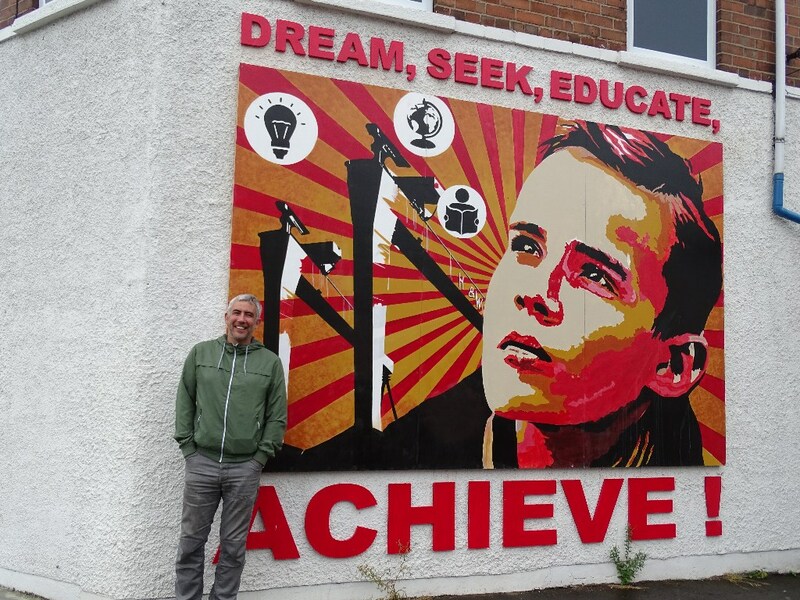 Swarthmore Professor Lee Smithey and his colleague, Prof. Gregory Maney (Hofstra University), have been studying the changing mural arts scene in Northern Ireland. The Mural Mapping Project uses geographic information systems (GIS) technology and statistical and qualitative methods of inquiry to analyze murals and other ethnic and political displays in West Belfast and the Greater Shankill Road area, such as memorial gardens, monuments, sculptures, and other forms of public art. As part of the Mellon-funded Tri-College Creative Residencies Program, David “Dee” Craig, a mural artist from Belfast, Northern Ireland, will come to the Tri-Colleges for a month-long residency immediately following Fall Break. Part of the residency will involve painting a mural on our campus, and we would like to invite anyone who is interested in helping to conceptualize the content of the mural to join us for discussion on *Thursday, September 5 at 4:00 p.m. in Kohlberg 228 and on *Wednesday, September 11 at 4:00 p.m. in Kohlberg 228. Stay tuned for more announcements about events related to the residency. 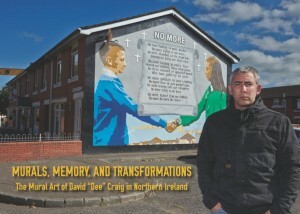 This past spring, Prof. Lee Smithey successfully applied with a range of partners to bring Belfast-based mural artist, David ‘Dee’ Craig, to the Tri-Colleges for a month-long residency during the fall semester 2013. Mr. Craig’s visit follows a visit by the Bogside Artists in 2008. Prof. Smithey and his colleague, Prof. Gregory Maney (Hofstra University), have been studying the changing mural arts scene in Northern Ireland. 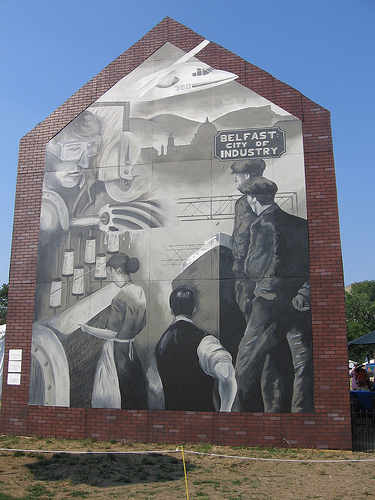 The Mural Mapping Project uses geographic information systems (GIS) technology and statistical and qualitative methods of inquiry to analyze murals and other ethnic and political displays in West Belfast and the Greater Shankill Road area, such as memorial gardens, monuments, sculptures, and other forms of public art. Though Mr. Craig has a burgeoning fine art career, with exhibitions in Northern Ireland, Great Britain, and California, Mr. Craig’s residency will focus on his community and mural art and will provide an opportunity for students, faculty, and staff to explore the role that public art can play in framing public issues and collective identities. 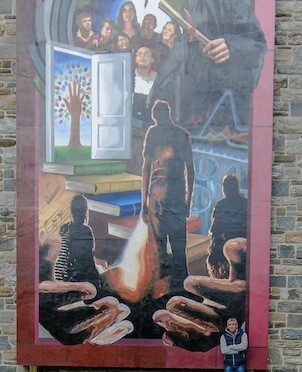 An exhibit of Mr. Craig’s mural art will appear in McCabe Library. He will offer public talks, paint a mural on Swarthmore’s campus, and visit classes at each of the Tri-college campuses. Students who would like to engage the residency from an academic perspective and for course credit can register for SOCI 025B, “Transforming Intractable Conflict” at Swarthmore. Stay tuned as more details will be announced in this blog.